You're facing an uphill climb of 3129 vertical meters on this hike. This is quite much. You should be fit to do this track. The high point of the hike is located at an elevation of 3707 ft.
You're traveling a distance of 58 miles on this moderate trail. This makes it a relatively long hike. Average length of all hikes in Lower Saxony is 28 miles. This moderate hike is perfect for the whole family. The so-called Harzer Hexenstieg leads from west to east across the Central German Uplands, home of the mysterious Harzer Brocken. This trail is known to be one of germany's most beautiful long-distance trails and takes about five days, starting in Osterode in Lower Saxony, finishing in Thale, Saxony-Anhalt. Through thick forests, deep ravines and valleys, untouched bog and lush meadows you'll hike more than 90km/56mi and one thousand metres in altitude. Eventually you'll also hike across the 1141m/3743ft high Brocken at Harz National Park. Easy to recognize are the signposts equipped with little green witches, to guide the way. You should know that Johann Wolfgang von Goethe, himself, already hiked through the region Harz and wrote about it in his works. The most common way to hike this trail is to devide it into five different stages for five different days. Whereas the division may of course be chosen individually. This trail is also suitable for children since you might take a detour avoiding the Brocken. There are however some short but steep parts, namely at the descent at Altenbrak and at the end down to Thale. Before you start take a look at the picturesque town Osterode. It is worth it. The first stage you will mainly walk on slowly ascending paths. In earlier times this trail called historic Hundscher Trail was used by donkey caravans carrying crop into the mountain settlements. Along the way you'll pass „Eselsplatz- Donkey Square“, where you'll also find the guesthouse Köhlerhütte to take a short break. After approximately 2h you'll reach Marienblick, where you'll have a great view across the valley Lerbachtal. Then continue on broad paths, passed the pond Bärenbrucher Teich, to Buntenbock, a calm district of Clausthal-Zellerfeld. The highlight of this second stage is the so-called Oberharzer Wasserregal, an old levee construction with underground canals, which supplied the energy for mining in earlier days. Look for the spots where the water runs in and out of the ground and you'll get an idea how the construction worked. Also the levee „Sperberhaier Damm“ supplied water to the Clausthaler mines and is an impressive construction. This levee is part of the UNESCO World Heritage. Now traverse the plateau Clausthaler, with its various ponds and after 15km/9.3mi you'll get to the next mountain village, namely Altenau. This is where Harz National Park starts. Follow the trail alongside a levee ditch through the woods. If you're really lucky you might see the „King of Harz forests“- a lynx. After a short ascent now you'll reach the hamlet Torfhaus, where you'll find the visitor centers. Not only exhibitions but also rangers give informations about the national park. They also offer guided tours. Torfhaus was founded in 1713, when Torf (peat) was started to be exploit from the surrounding swamps. This is also where Johann Wolfgang von Goethe started his ascent of Brocken in 1777. Interesting to know is that this trip inspired him to write the Walpurgis Night scene in „Faust“. As a result the trail all the way up to Brocken was named after him. Further on wooden panels disposed on top of the swamp help you cross the so-called Torfhausmoor. From this point on „Goetheweg“ will guide you. Alongside the ditch Abbegraben and through thick forest up the highest mountain of northern germany. Continue passed an old weir and across Quitschenberg further to Eckersprung, where you'll pass the former border area between west and east germany. There you'll have the opportunity to rest at a mountain hut. Afterwards follow the former border on the so-called Kolonnenweg. This trail leads along the train tracks of Brockenbahn, which runs all the way up to Brocken's peak. Brockenbahn is very traditional and still steam-driven, like hundred years ago. Eventually on top of Brocken you'll get rewarded with a wonderful view across the area Harz and its surroundings. The legendary Brocken counts over one million visitors a year. Therefore the peak is well equipped with accommodations, a visitor center with a museum, various restaurants as well as a train station and botanic gardens. Some remaining radio masts from GDR times show that this was the place all western radiocommunication were spied upon. The mountain is often covered in mist but if you catch a sunny day it's worth taking the panorama trail around the peak, passed Hexenaltar and Teufelskanzel. It is said the witches of Brocken meet at these cliffs on Walpurgis Night. The myth about witches meeting here date from the days of witch-hunting, when the defendants were accused of taking part in secret meetings especially on Walpurgis Night. This popular belief was further fueled by various works of literature and until today Walpurgis Night is being celebrated up there. Now hike back down across cliffs, thick forests and mountain meadows until you get to Schierke. Take a short break at the National Park House and continue passed a small settlement and passed a Brocken train station called „Drei Annen Hohe“. Hike another 1,5h through thick forests, passed the rest area Steinbachtal to Königshütte. Follow the path uphill in Königshütte where the rivers Kalte and Warme Bode flow together, towards Rübeland. In Rübeland strip mining is being operated until the present day. Very impressive are the dripstone caves, definitely worth a visit. Continue alongside the river Bode without any significant ascent until you reach the barrage Wendefurth. Close by you'll find the massive dam wall Rappbode, which is germany's biggest drinking water barrage with various inflows. Keep following river Bode and you'll reach a calm hamlet called Altenbrak. Especially delicious are the hamlet's grilled trouts from the local trout farm. The trails last stage leads continuously alongside river Bode, which winds through the areas own Grand Canyon – Bodetalschlucht. First the path leads about 4km/2.5mi from Altenbrak to Tresburg, where the nature reserve Bodetalschlucht starts. You'll hike through romantic landscape, passed steep faces covered in beeches, spruces and yews. The ravine Bodetalschlucht is known to be the deepest coulee north of the alps. Its granite rocks are up to 250m high. Before leaving the ravine you may take a detour to your left up to Roßtrappe, where you'll have an incredible view across the surrounding valley. After walking another 9km/5.6mi alongside the river, the landscapes flattens and a view across the spacious foothills emerges. Shortly afterwards you'll reach Thale, the final destination of Harzer Hexenstieg. Various places to get food are located in Osterode, Buntenbock, Altenau, Torfhaus, Brocken, Drei Annen Hohe, Königshütte and Thale. You'll also find great accommmodations to spend the night. Hexenstieg trail traverses almost all parts of the district Harz and offers many attractions along the way. 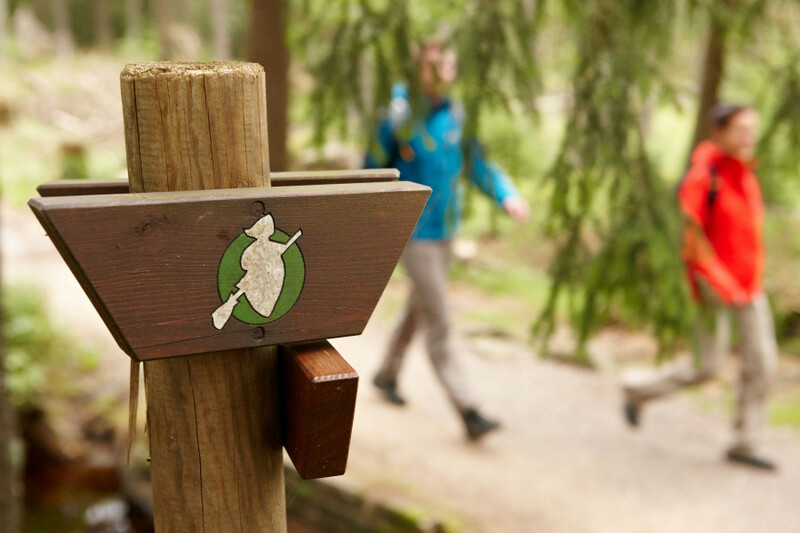 While ascending the famous Brocken you'll hike through the unique landscape of Harz National Park, home of many endangered animal and plant species. Definitely worth the trouble is the spectacular view down from Brocken's peak. Another highlight is the UNESCO World Heritage, Oberharzer Wasserregal, also various mining relicts and old towns along the way. Last but not least to mention is the impressive ravine Bodentalschlucht as one of the tour's highlights. This bypass around Brocken is about ten kilometres longer than the trail across Brocken but also way less steep. First you'll hike through the national park until you get to the oldest german barrage, namely Odenteich. This is an ideal place to take a break, enjoy the trees' shadow and regain energy by the water. Afterwards continue along the ditch Rehberg across meadows and fields towards Sankt Andeasberg. This idyllic mountain village is located on a plateau and surrounded by lush meadows. You may also visit the mining museum. Soon you'll reach Braunlage the center of tourism. Before you continue to Königshütte take some time to stoll through the lovely town Braunlage. The last part leads passed lakes and small barrages built for flood control. Leave the valley of river Warme Bode to the south and soon you'll get to barrage Rappbode. Up on the dam wall you have a view across the massive barrage. Shortly afterwards you'll pass another barrage, namely Hassel-Vorsperre before you get to the plateau Hasselfelde. The adventure park located at the plateau shows life and culture of the wild west. Behind Hasselfelde starts the path Köhlerpfad. Coal has always been important to the mining region Harz. Following this path you will soon get to a small family owned factory still producing coal. Close by you will also find a museum about the Köhlers, exhibiting the traditional way of winning coal and reveal the conditions under which miners had to work in earlier days. Eventually you'll hike through thin forest down to Altenbrak. We recommend weather appropriate clothing and sturdy shoes. Furthermore you should bring enough food and drinks since there are long stretches on which you won't find a place to eat. Also be aware that it'll be chilly and windy on top of the mountain Brocken. Coming from the south via A7 exit in Northeim West and follow B241 to Osterode. Coming from the north via A7 exit in Seesen/Harz-Osterode and follow B243 to Osterode. Trains run on an hourly basis between Nordhausen, Brauchschweig and Osterode.